You won’t find any filters or camera buttons on 500px, a mobile photography app. 500px is a social portfolio app for amateur and professional photographers, and has been hailed as a Flickr killer since it launched in 2011. The startup released version 2.0 of its iOS app today with a completely renewed design, and support for iPhone 5 and iOS 6. 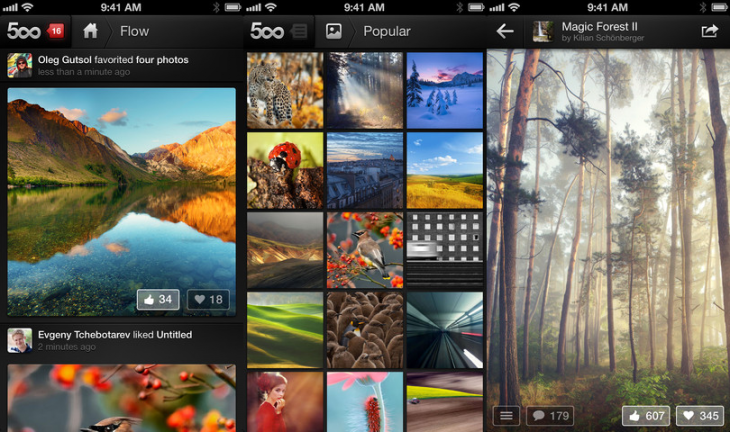 500px CEO Oleg Gustol adds that the company has been working on the redesign to the iPhone app for some time now. It’s not an update that the team has taken lightly. “We only release a new product or an update when it meets our high aesthetic and functional standards and enhances our photographers” experience,” said Gustol. The best feature that we have to credit 500px with is its profile page. Users can prominently feature their best photo in its full size as their “cover” photo, and there isn’t much of an emphasis on the profile photo as it’s just a minute thumbnail. A user’s “wall” is just a scrollable stream of images that they’ve shared on their profile page. If you do a side by side comparison between Flickr and 500px’s apps, you’ll be immediately drawn to the latter. To back this up, the company revealed that its iPad app had over 100,000 downloads in the first week of launching, and may reach 1 million downloads on Android and iOS devices before 2013. 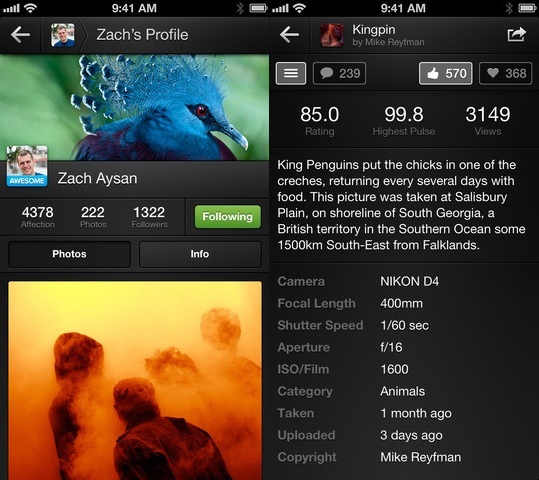 You can download the new version of 500px for iPhone here.